It was the height of the depression and America was in desperate need of a hero. They found it in the most unlikely of places . . . a battler who looked about as beat up as the nation itself. For a racehorse, he didn’t have much going for him. His legs were too short, his neck was too thick and he had a swaying foreleg that jutted out wildly. Worst of all, he had a mind of his own. When he felt like running he’d run, when he didn’t, he wouldn’t. It’s hard to believe that this horse, having lost his first 17 starts, would become a legend – the greatest racehorse in history. In this episode of Biographics we reveal the amazing story of Seabiscuit – the horse that brought a nation together. Seabiscuit was born (or more accurately ‘foaled’) on May 23rd, 1933 in Lexington, Kentucky. He was the son of a nasty-tempered rogue named Hard Tack, and a gentle mare named Swing On. Seabiscuit’s father had great speed, no doubt owing to his own pedigree. 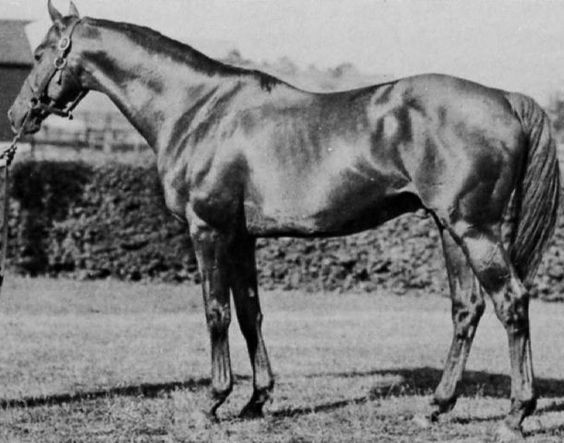 His father, Man o’ War, was considered by most experts at the time to have been the greatest racehorse ever produced… although his grandson would certainly go on to challenge that claim. The problem with Hard Tack was that he was uncontrollable… Even hall of fame trainer ‘Sunny’ Jim Fitzsimmons couldn’t tame him. Seabiscuit’s mother was the complete opposite of Hard Tack. She was a calm, gentle horse with thick knees and short legs. Swing On wasn’t very fast though, so she never raced… The colt that she sired didn’t look very promising. His legs were stubby, his knees were thick and he looked sort of ‘funny’ when he ran. Even Seabiscuit’s color was against him. He was a solid muddy bay with no distinguishing white stripe or star on his face. During his first year, Seabiscuit, along with his mother, was put into a 50-acre pasture with nine other thoroughbred mares and their newborn foals. In every group of colts there are usually two that stand out – one is the hero, the better looking, more graceful, and faster one; the other is the outcast, an awkward, looking runty little fellow who looked as if he slipped in when no one was watching. In this group the hero was Granville, and the outcast was Seabiscuit. But, something in Seabiscuit stood out to keen observers. Several times a day the colts would race up and down the paddock with Seabiscuit always at the rear. Yet, the gangly colt was never discouraged. The farther he was left behind, the harder he drove himself – and the longer the race, the nearer he came to catching up. Emerging as a yearling on January 1st, 1934, Seabiscuit looked more like a ragged range pony than a thoroughbred. He had failed to shed his winter coat and his legs and back were a few inches shorter than average. In fact, he was such an ‘ugly duckling’ that when Mrs Phibbs came in April to inspect her horses, Seabiscuit was hidden away in an outlying barn. By now, though, Seabiscuit had found his running legs. He was challenging Granville for the lead… He may not have had the physical attributes of the other horses, but he was full of stamina and determination. By mid-summer the rivals were racing neck and neck. It was then that Seabiscuit developed a habit that would be a trademark for the rest of his life – whenever they were vying for the lead, he would snort at Granville, as if attempting to bully him and throw him off pace. 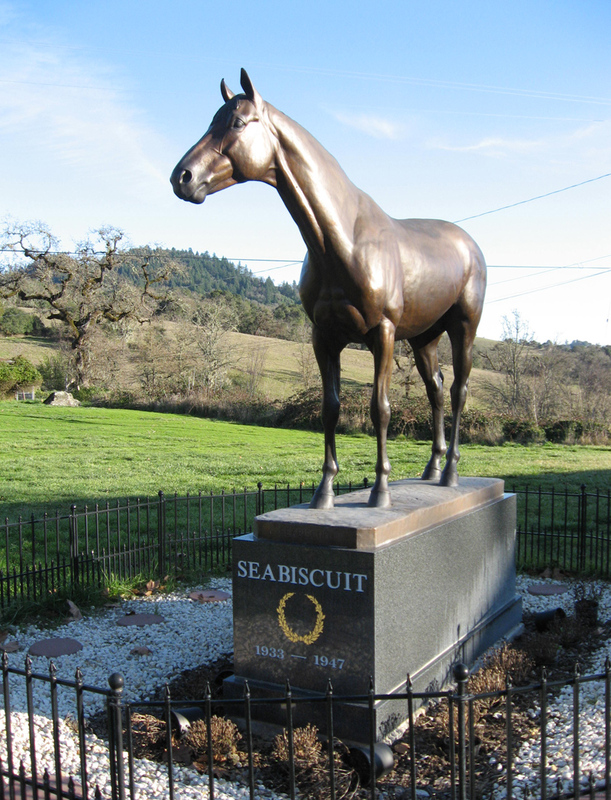 After he retired from racing, Seabiscuit lived at Ridgewood Ranch near Willits, California. In this image, we see the Biscuit with Charles Howard, his owner. Image online, courtesy Seabiscuit Heritage Foundation. In June, 1934 Granville and Seabiscuit were shipped to ‘Sunny’ Jim Fitzsimmons, recognized as the finest trainer in the country. Fitzsimmons had developed a hatred for Seabiscuit’s father, Hard Tack, after years of being unable to break him of his vicious habits. He had also given up on Swing On, finding her too slow and lazy. This did not bode well for Seabiscuit, who Fitzsimmons looked upon as a curse from the very beginning… He put the majority of his energies into training Granville, while forcing Seabiscuit to conform. Seabiscuit, meanwhile, was determined not to comply – he simply refused to go fast! Finally, an exasperated Fitzsimmons gave his jockey a wooden stake and told him to ‘hit Seabiscuit just as many times as you can in a quarter mile.’ They ran him against Faust, the fastest sprinter among the group. 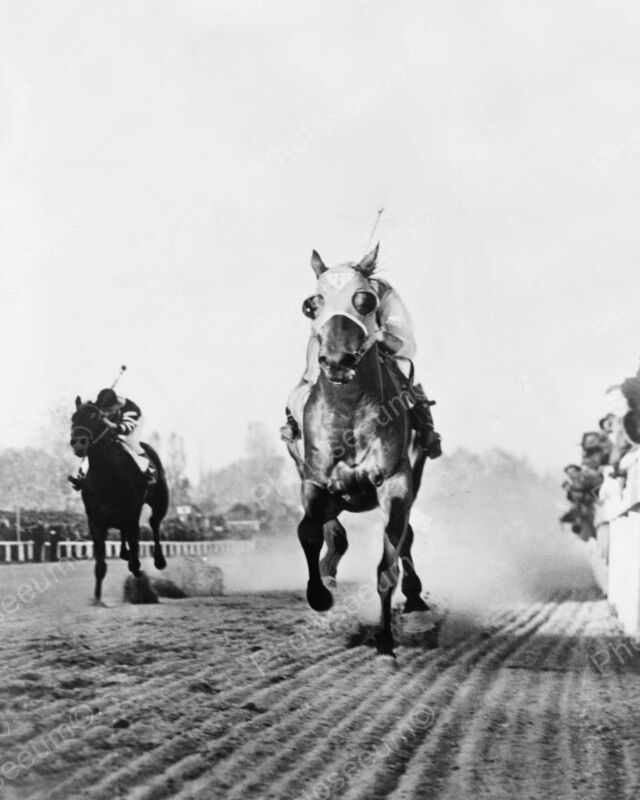 In trying to escape the severe beating, Seabiscuit exploded around the track, leaving Faust far in his wake. He ran the quarter mile in 22 seconds and 2/5ths. If you didn’t know this is a pretty incredible time… It amazed Fitzsimmons, but it also confirmed in his mind that Seabiscuit would only show his potential under severe punishment. It was only when his jockey stopped beating him and let him run his own race that he showed real promise. He won five races, setting three track records in the process. Still, Fitzsimmons was desperate to get rid of him, convinced that Seabiscuit was an inconsistent no hoper. April 22, 1938: The original Seabiscuit, with his trainer Tom Smith. 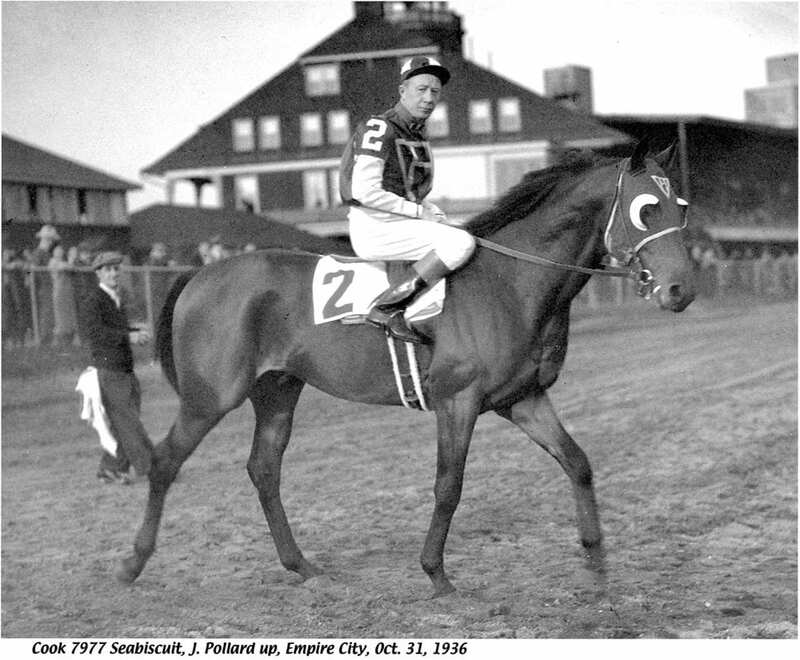 On August 3rd 1936, Fitzsimmons entered Seabiscuit in the $6000 Claiming Stakes at Saratoga. Fortunately for him, this just happened to be one of those days when Seabiscuit decided to turn it on – he won by six full lengths. Up in the stands an old time cowboy and veteran trainer, Tom Smith, saw heart and courage in Seabiscuit. He decided that he had to have him. A week later Seabiscuit was purchased by Charles Howard for $8000 and handed over to Tom Smith for training. The horse finally had a trainer who both respected him and saw his limitless potential. Seabiscuit was subjected to an intense conditioning campaign. The horse that no one had wanted was pampered and groomed with a focus on foot care to recover from the gruelling schedule he had been forced to endure under Fitzsimmons. As a result of the care and attention that was lavished upon him, Seabiscuit began performing more consistently on the practice track. He became gentler and seemed to develop a competitive spirit. He also developed a huge appetite, eating anything that was put before him. To keep his weight down, grooms were instructed to muzzle him at night to prevent him from eating his straw bedding. Seabiscuit, shown here with Red Pollard aboard. Smith found him in the form of Jack ‘Red’ Pollard, a feisty 27-year-old Canadian, who’d been roaming around the west riding and boxing for over a decade. His love for thoroughbreds was as deep as Tom Smith’s… Yet, although he was one of the better jockeys on the bush circuit, he’d won only three stake races in his life. 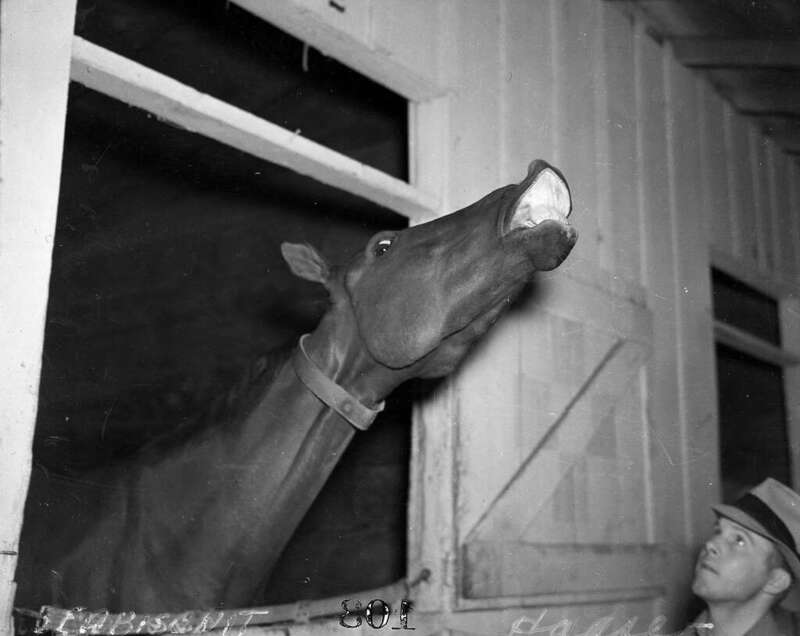 When Red first entered Seabiscuit’s stall, the horse was busy munching on straw. Seabiscuit looked up, gave a snort and then ambled over to Pollard and rubbed his muzzle against Red’s shoulder. And with that, one of history’s great partnerships was born. 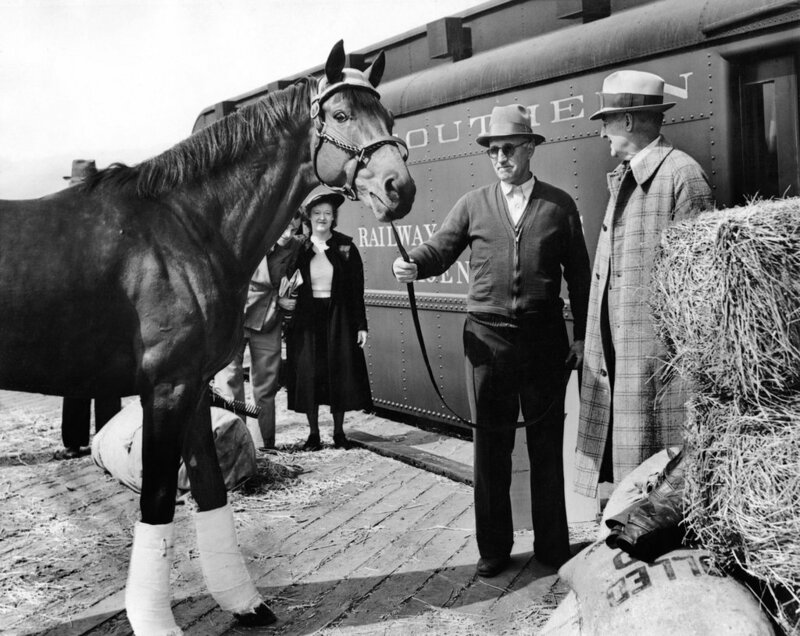 In November, 1936, Seabiscuit was sent by rail to California to compete in his last two races as a three-year-old. The first was the Bay Bridge Handicap. Despite starting badly, Red and Seabiscuit soon found their stride and they won by five lengths. In their last race of the year, the World’s Fair Handicap, they led from the start, cruising to an easy victory. By the beginning of 1937, Seabiscuit was beginning to develop a reputation as an up and coming champion. The focus in the early part of the year was March’s Santa Anita Cup – the biggest race on the West Coast. Seabiscuit started the year well, winning a warm up race at Santa Anita in January. Then, in the San Antonio Handicap, he was bumped at the start and pushed wide, finishing a disappointing fifth. Now it was time for the big one – the $125,000 Santa Anita Cup. Coming down the home straight, Seabiscuit was a half-length ahead of Rosemont, the horse which had won the week before at San Antonio. But Red Pollard, who was blind in his right eye, didn’t know that Rosemont was closing in and failed to urge Seabiscuit into the next gear… Rosemont won by a nose. This disappointment though, was followed up by three easy wins, establishing Seabiscuit’s reputation on the West Coast as the breakout thoroughbred of the year. By this time Charles Howard was making some pretty great money off of his investment. But he wanted more. He was determined that Seabiscuit be recognized as the greatest race horse in the entire United States. That meant breaking into the far more prestigious East Coast circuit. So, between June 26th and August 7th, he entered Seabiscuit into five east coast races, and won every one of them. He finished 1937 with a record of 11 wins out of 15 races and was the biggest money earner in the country. He was also now the most famous horse in America, with the press having a field day with his underdog story. The nation’s most prestigious equine award, however, did not go to Seabiscuit that year. The winner of the American Horse of the Year Award was the darling of the East Coast set, War Admiral, who had just won the coveted Triple Crown. War Admiral, son of Man o’ War, won the 1937 Triple Crown. 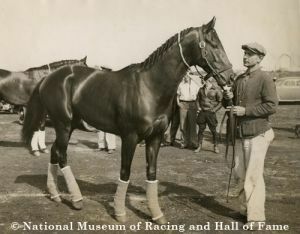 Photo courtesy of the National Museum of Racing and Hall of Fame. Interestingly, War Admiral and Seabiscuit were actually blood relatives. They were the son and grandson of one of the greatest thoroughbreds in history, Man o’ War. Seabiscuit’s father, Hard Tack, was War Admiral’s brother. 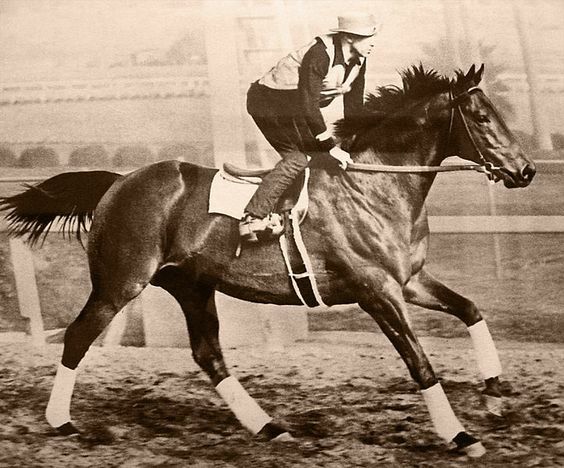 In 1937, War Admiral won every race he started, including the Triple Crown. This prestigious honor is bestowed upon thoroughbreds that win three major races in succession: The Kentucky Derby, Preakness Stakes and Belmont Stakes. But War Admiral’s victory at Belmont… it was bitter sweet. An injury prevented him from racing again for several months. At the beginning of 1938, War Admiral was the best horse in the east and Seabiscuit was the best horse in the west. Race fans were anxious for the two champions to meet. 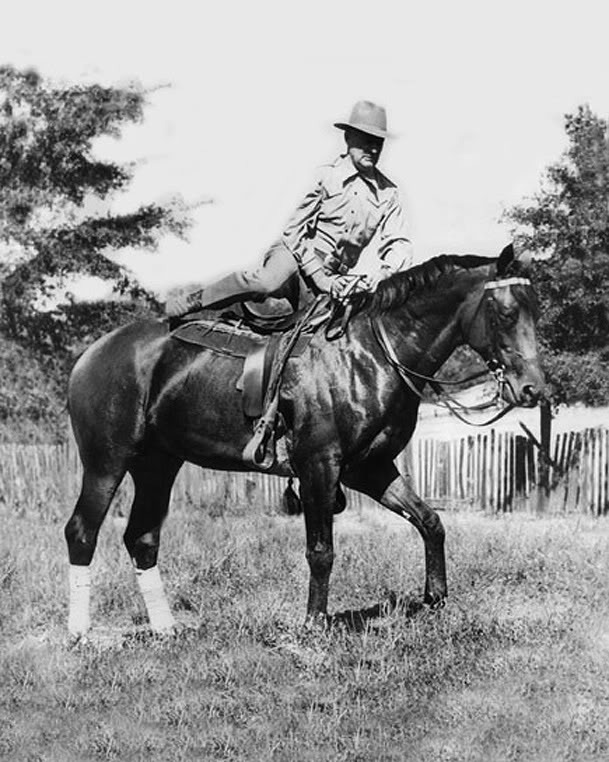 But Charles Howard knew that despite the public’s fascination with his unlikely star, if Seabiscuit were to be taken seriously as a challenger to War Admiral, he would have to establish his own reputation in the east. Howard was a master promoter and he capitalized on the established racing rivalry between the east coast and the west coast. He was determined to prove that a horse coming out of California could be the equal of anything that ran in the east. He began issuing public challenges to Sam Riddle, the owner of War Admiral. Riddle ignored him, considering it demeaning for his champion thoroughbred to meet a western horse… After months of incessant media chiding, though, well, he finally agreed. The question of who was the fastest horse in the United States would be decided by way of a race to be held at Pimlico Racetrack in Baltimore, Maryland. This would take place on November 1st, 1938.The distance was one and three sixteenth miles. Riddle insisted, however, that the race begin with a no gate, or walk-up start, to avoid War Admiral’s temperamental behavior in the gate. Howard agreed to start the race with a starting bell, but he also had a condition; the track had to be ‘fast’ or dry. Seabiscuit did not run well in the mud. If the track was too wet because of rain, the race would be called off. Then things started to go wrong in the Seabiscuit camp. Red Pollard fractured his leg while working with another horse and was unable to race. Pollard’s good friend and fellow top jockey George ‘The Iceman’ Woolf would ride Seabiscuit. Up until that time, every match race in history had been won by the horse that was in the lead from the start. Throughout all of his races in 1937, War Admiral had never let another horse in front of him. Yet, Seabiscuit was a ‘come from behind’ winner. War Admiral’s trainer George Conway and jockey Charley Kurtsinger were confident that their horse was faster than Seabiscuit. So, they concentrated on building War Admiral’s stamina to endure the mile-long distance. Meanwhile, Tom Smith was concentrating on the start of the race. He put together a homemade bell that started like the starting bell at Pimlico. When he rang the bell, Woolf cracked the whip on Seabiscuit’s backside. This conditioned Seabsicuit to run at top speed immediately. The race of the century was a worldwide sensation. The race track was so crowded that ten thousand people crowded outside the gates, sitting in trees, and standing on cars roof tops to try to see the race. Across the United States 40 million people tuned in to their radios. Many of them had never before cared about horse racing but now were eager to hear history being made. Most of them were rooting for Seabiscuit. Charley Kurtsinger, on War Admiral, wore black and yellow silks and rode the rail, while George Woolf, with red and white silks, sitting astride Seabiscuit, took the outside. War Admiral prepared for the race the way he always did, rearing up and tormenting his handlers. Meanwhile Seabiscuit calmly headed for the post. The flag was raised and the horses lined up. But just as the starter was about to ring the bell, Woolf pulled Seabiscuit back. It was a tactic to make War Admiral nervous. When they lined up a second time, Kurtsigner pulled his horse back. On the third try, both horses lined up at exactly the same moment. The starter bell rang and they were off. The two thoroughbreds pounded down the track neck and neck. It was commonly believed that War Admiral would take the early lead. So, the crowd were astonished when Woolf cracked the whip and Seabiscuit edged in front. Around the first turn Seabiscuit was still ahead. Woolf veered left and took the rail from Kurtsinger. Then he slowed Seabiscuit right down in front of War Admiral in order to conserve energy. Kurtsinger now either had to slow down himself or pass Woolf. War Admiral drew closer but Seabiscuit was still ahead by a length and a half. Going into the backstretch, the distance widened to two lengths. Then Kurtsinger cracked the whip and in just a few strides War Admiral was even with Seabiscuit. The crowd were going wild. Around the turn as they headed for home, Woolf cracked the whip, asking Seabiscuit for everything he had. He loosened the reins and his horse answered. Dropping his chin, his ears pinned back he raced toward the finish line. The crowd were astounded to see Seabiscuit break away by one, two, three lengths. In the end it was no contest. 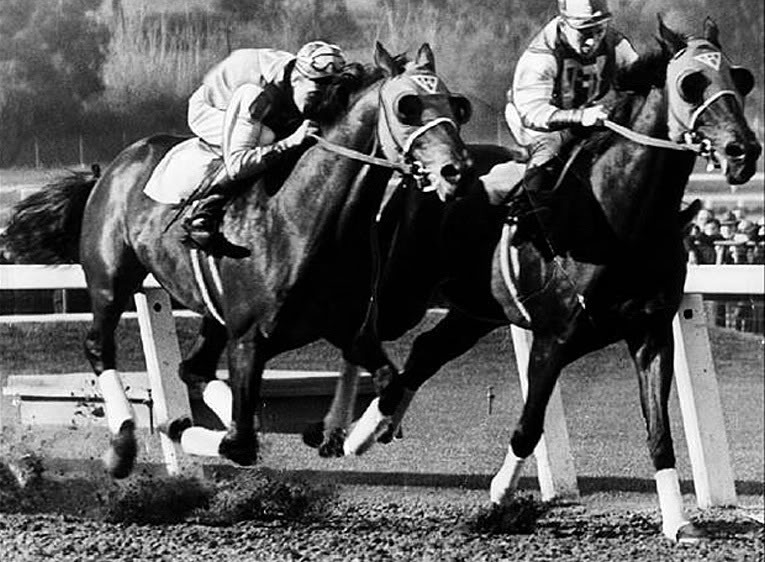 Seabiscuit was the winner by four lengths; leaving War Admiral in his dust. Seabiscuit was now, not only the national racing champion, but the fastest and most famous horse in the world. He easily won horse of the year in 1938. 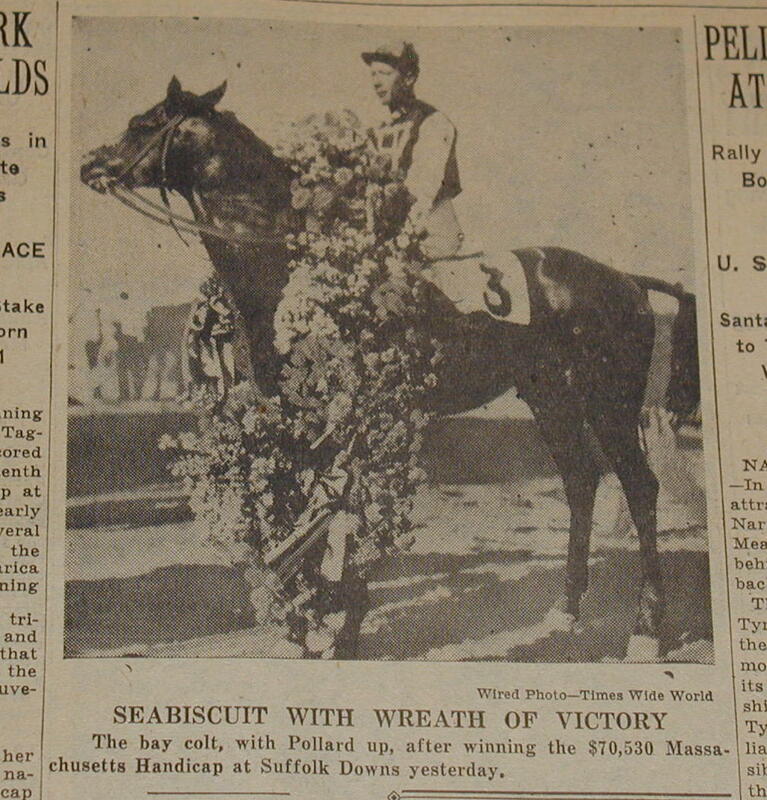 Following the Santa Anita victory, Seabiscuit retired with a record of 33 victories from 89 races. He had earned Charles Howard $438,000, an American record at that time. Seabiscuit died suddenly of a heart attack on May 17th, 1947. Three years later, Charles Howard’s horse Noor won the 1950 Santa Anita Handicap. When a reporter suggested that perhaps he’d found another Seabiscuit, he answered . . .